Since opening last year, Stevie Parle’s Pastaio has become unsurprisingly popular. Part of a new breed of Italian-inspired restaurants; the simple pasta dishes are the main draw at Pastaio. All pasta is made on-site each day by the restaurant’s Pastai, handmade with some of the best ‘OO’ flour available and eggs from Rodley Court Farm. 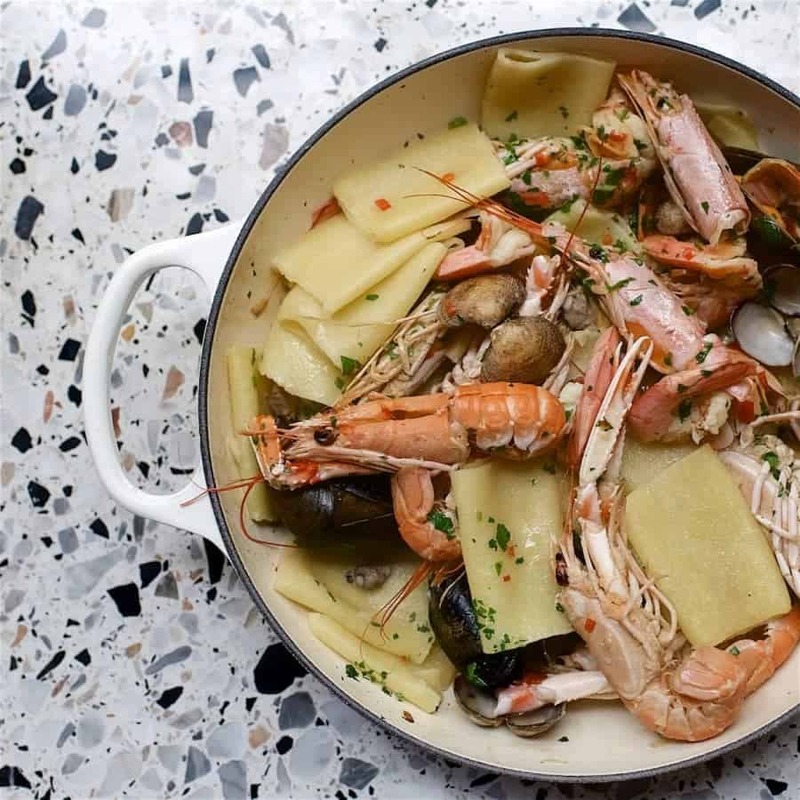 From the regularly changing menu, highlights might include bucatini cacio e pepe, paper-thin agnoli filled with pheasant, rabbit and pork; or this seafood pasta dish, intended to be shared. Mussels, 150g, washed, beards removed, etc. Boil a pan of well-salted water. Heat a large shallow casserole dish (we use a 26cm cast iron shallow casserole dish from Le Creuset) over a medium heat. Make sure you have everything ready as above, garlic chopped and all the seafood prepped etc. You’ll need to move fast once you get going. Drop the pasta into the water. Add the oil to the warm casserole dish and fry the garlic and chilli until it just starts to brown. Add the seafood (except the crab) and coat well in the garlic/chilli oil. Add the white wine, turn up the heat and cover with a lid. Once the pasta is a couple of minutes from being cooked, add it to the seafood and continue to cook all together. Finish with the chopped parsley, crab and a little more olive oil. Give it all a good toss around and serve in the pan. Further information on Pastaio can be found here.